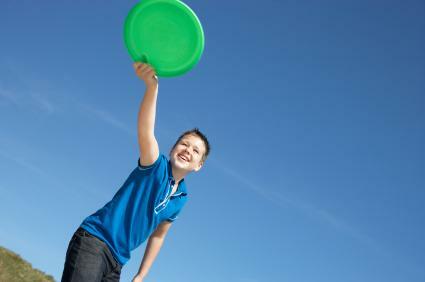 For more fun and excitement at your beach party, consider adding a few games to play. Party games make it easy to involve everyone in the fun and can appeal to people of all ages and abilities. Games are not only fun to play but can be amusing to watch as well. Creating a bingo card with a blank grid. Make enough copies for every guest. Have guests write a beach themed word into each square. Before the party, have beach words written on slips of paper and put them in a beach bucket. Draw the slips of paper from the bucket and announce the beach word that is written on the slip. Guests will cross off words from their cards as they are called. The winner can be whoever fills his or her entire card or gets a row of marked spaces. Instead of yelling bingo, have the winner yell beach! 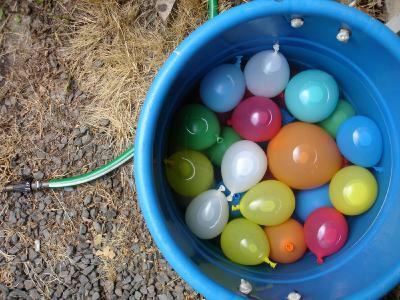 Before the party, fill up balloons with water and place them in a kiddie pool or large bucket. Divide guests into teams of two. Have each team toss the water balloons to each other. When a balloon breaks, the team is out. Be sure to have enough hula hoops for each team of players. Line up the teams so that each player is standing side by side. The first player in each team gets a hula hoop. Everyone must link hands and attempt to get the hula hoop down the line without letting go of anyone's hands. If someone lets go, the team has to start over. Whatever teams completes the race first is the winner. This game is fun for kids and adults. It is played like the classic hot potato. Have guests stand in a circle. Give one guest an inflated beach ball and begin playing music. As the music plays, have the guests toss the all to one another. The guest holding the ball when the music stops is out. Keep playing until only one guest is left in the circle. These games are perfect for a day at the beach. Divide participants into teams of two, three, or four, depending upon the number of players and the time allotted. Choose a team of judges. Instruct teams to create an elaborate sandcastle within a designated time period. 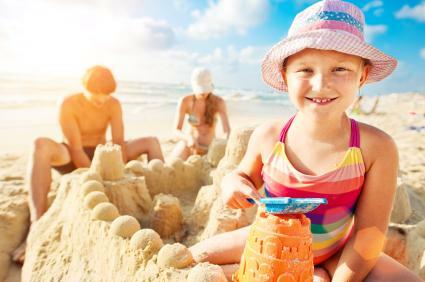 You can give guests sandcastle building supplies such as buckets, small shovels, molds, and empty containers. Teams must stop building their sandcastles when the time is up. Judges then choose a winning team based on specific criteria, such as neatness, creativity, teamwork, etc. Create a printout featuring pictures of different types of shells. Give each child a bucket to use for collecting the shells. Be sure to designate a section of the beach for the hunt making it obvious of the boundaries. For younger kids, lay out shells ahead of time making it easy to find them and add them to the bucket. Once everyone is ready, give the signal, and instruct your guests to find as many different kinds of shells as possible. Lay the beach towels on the sand in a big circle. Have players form a circle outside of the towel circle. Play the music, and instruct players to continue walking around the outside of the beach towels until the music stops. When the music stops, players must sit down on a vacant beach towel. The person left without a towel is eliminated from the game, and a new round begins. The last person who remains at the end of all the rounds wins. Create a starting point and ending point along the beach by either placing cones or drawing a line in the sand. Have racers line up behind their coconuts. Decide how you want racers to move their coconuts.They can either kick them or roll them with their hands. The player who moves his coconut across the finish line first wins. Before the party, create golf goals along the beach and mark them with colored cones if possible. Goal suggestions could be hula hoops placed along the shore, beach umbrellas turned upside down, small clean garbage cans, and sporadically placed beach towels. Players take turns throwing the Frisbees at each goal. They must keep track of how many tosses of the Frisbee it takes to reach each goal. Once all players have finished the course, the person with the least amount of tosses wins. This classic game is ideal for the beach. You will need anywhere from four to around 12 to 14 players. Use a volleyball or inflatable ball and have teams try to hit the ball over the net and away from the opponents. If you do not have a net, draw a line in the sand as a divider. Whatever team scores the most points is the winner. This game can be modeled after the popular TV show Survivor and will take some preliminary planning. You'll want to have a large group for this game, so you can divide into at least four teams with three to five people on each. Create a list of challenges that teams must face, such as walking on their hands across the sand, burying teammates in the sand, and so on. Have teams compete to win each challenge. Eliminate one team per challenge. 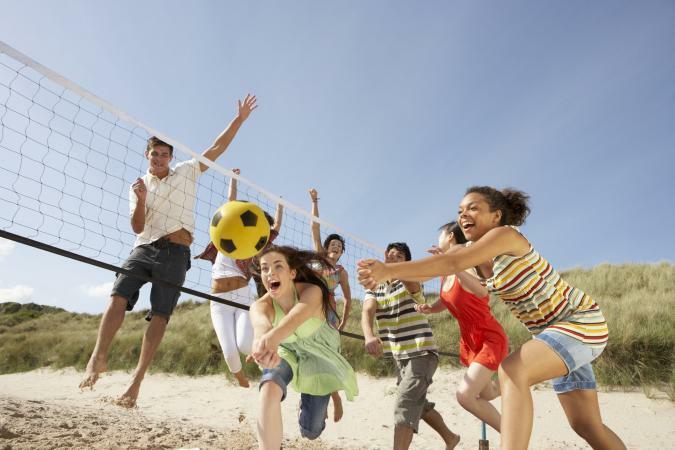 Your family and friends can spend a day at the beach playing a variety of fun games. Be sure to offer games that will appeal to all of your guests so that there is something for everyone to enjoy.